Baker contends that the conditions are rare, and occur only in summer. However, many locals have reported that the noise they experienced last winter in generally higher winds was worse than the summertime conditions in which the recordings were made; it will be interesting to see whether new recordings this winter confirm these experiences (the formal protocol for measurements was not agreed upon until June). While FIW has said it looks forward to resolving the issues, and is pursuing several approaches to reducing noise output, neighborhood group Fox Island Wind Neighbors notes that recent statements have been more confrontational than collaborative, including a mailing to ratepayers stressing the cost of responding to complaints. At the root of the problems is that townspeople were led to expect that the turbines noise would always be drowned out by the sound of the wind itself, which has proven not to be the case. In addition, neighbors have been frustrated at the lack of more immediate changes to turbine operation once noise was clearly an issue; initially, FIW seemed sympathetic to the problems, but over time, neighbors have felt marginalized, and the original promise of small-town communication leading to a shared solution has slipped further from reach. On the other side of the coin, FIW’s attempts to assess the effectiveness of slowing turbines down have been hampered by the fact that several neighbors distrusted the process and refused to participate in surveys during operational experiments; one lost opportunity there was determining whether a few decibel decrease in noise was even noticeable to neighbors. FIWNeighbors just filed a second formal complaint, and has more than a dozen more cued up for submission soon. Meanwhile, down at the south end of Cape Cod, the town of Falmouth, Massachusetts also continues with its local wind turbine saga (see earlier AEInews posts). There, the town owns two turbines at the wastewater treatment facility, designed to provide over half the electricity used by municipal facilities in town (the first one began operating in March, while the second is still under construction). Similarly to Vinalhaven, though, neighbors within a half to three quarters of a mile have responded with surprise at the new noise intrusion at their homes. In particular, state noise guidelines limit new noise sources to be less than 10dB louder than existing ambient noise; according to Christopher Menge, who did the study, the single turbine is not close to that limit, but is often clearly perceptible. However, noise models suggest that the addition of the second turbine will push noise levels to just below or just above 10dB over ambient at several locations tested in the neighborhood. Likewise, the town noise limit of 40dB would probably be exceeded in some locations. Assistant town manager Heather Harper says it will likely take 12-18 months to assess the actual impacts and come up with appropriate mitigation measures as needed. 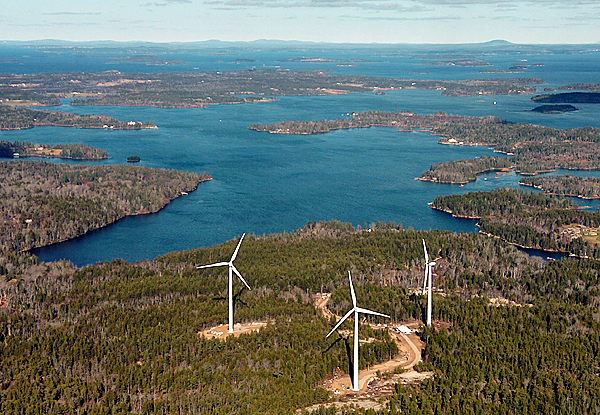 At the same time, the chairmen of the Falmouth Planning Board and Zoning Board of Appeals have drafted a new bylaw that would impose substantially stricter conditions on future turbines in town. Setbacks would be 10 times the turbine diameter; this would have imposed a 2690-foot setback, twice the 1300 feet that some homes now are from the town turbine. And noise limits would be reduced to 30dB, or 25dB if there is a noticeable pulse (amplitude modulation) in the turbine sounds. The hope is that the Planning Board will tweak and finalize the proposed ordinance in January, in order to get it on the April Town Meeting agenda.